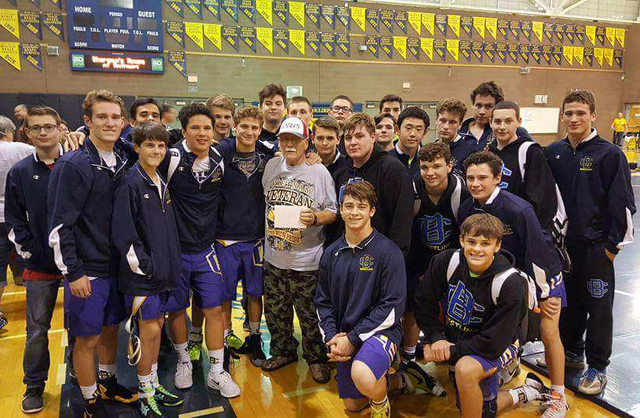 Members of Boulder City High School’s wrestling program are paying tribute to Charles “Chuck” Brown, a longtime Boulder City wrestling coach who died Friday at the age of 67. Courtesy photo Members of Boulder City High School's wrestling team gather around longtime wrestling coach Chuck Brown, who died Friday, Jan. 20, 2017. A fixture with the junior Eagles wrestling program, Brown served as a mentor for more than a decade to some of the Eagles’ past state champions and current state champion hopefuls. Paying their final respects to Brown, the entire team plans to be at his memorial service today at 11 a.m. at The Church of Jesus Christ of Latter-day Saints on Fifth Street across from the school.